and leave as friend ! where joy is confused and the heart is carried away. It is the perfect place to relax in luxury and enjoy your stay in one of the most beautiful places in the Italian Lake District. The charming single level superb waterfront villa (350 sq. mt. – 3.767 sq.ft. ) 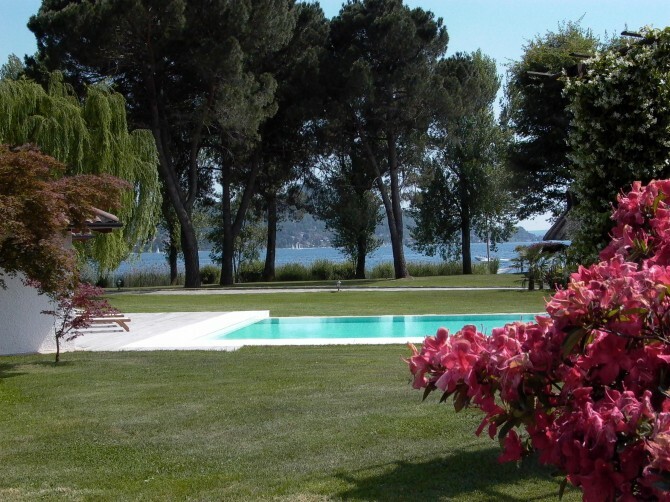 is located in the village of Lesa (between Arona and Stresa) right on shore of Lake Maggiore, away from the main road and only accessible through its private drive. It lies inside one of the lake’s largest properties; a private paradise with an 80.000 square meter park (20 acres) which extends up to the shore where peace, privacy and relaxation are guaranteed. All of the essential amenities and services (restaurants, cafés, supermarket, patisserie, post office, bank, hair dresser, bus stop, train station) are available nearby. Completely newly restored, it provides the highest standards and offers the best services you can find in the area. 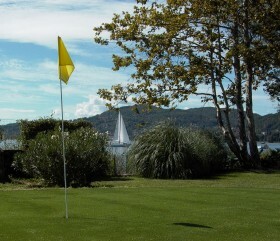 Swimming pool, Tennis court and a 9 holes private Golf practice course within the property as well as motor & sailing boats, a Helicopter BELL 206 Jet Ranger and a Rolls Royce are on place to be used. It’s a dream for outdoor entertaining. Other free amenities such as basket, volley, table tennis, soccer, dinghy sailing, canoeing, bicycles, gym fitness room, and several other sports and games are available at no additional cost. Family fun is easy here! On request you can practice water skiing or make a magnificent and romantic lake cruse with a 15 mt. vintage sailing yacht (year 1925). A 12 mt. vintage taxi motor boat (year 1926) can bring you as well to the most exclusive waterfront restaurants while tasting a glass of champagne at sunset, or bring you to visit the "Borromeo's" islands and the "Santa Caterina" convent situated on a cliff over the water. You can as well choose to make excursions to Switzerland, visit the botanical gardens of Villa Taranto, take a day trip to lake Como or visit the Saint Julian island on lake Orta, play golf at 5 nearby beautiful Golf coursees, make shopping trips to the elegant famous boutiques in Milan, mountain walking in the surrounding Alps at 2.000 mt. 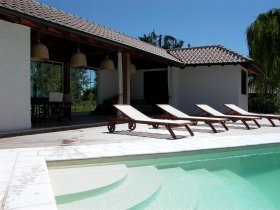 height, horse-back riding or just relaxing and sunbathing at the swimming pool. The DOLCEVITA RESORT, with its sophisticated elegant yet informal high quality Italian style and flavour and with its 4 double king size air conditioned bedrooms (sleeps 8) each having their ensuite bathrooms, is perfectly suited to welcome families with their children who like to be cuddled and spoiled in this idyllic lake front paradise as well as business meetings and weddings. Golfers and can reach heaven too! An independent guest cottage house with 2 single beds and bathroom is also available in addition to the main house. The villa has satellite TV-DVD, Stereo, High speed Wi-Fi internet, individually controlled air conditioning in each rooms, in room electronic safes, an antique fireplace, a large fully equipped kitchen, dish washer, washing machine, 3 hrs./day maid service (mon.- sat.) and much more. 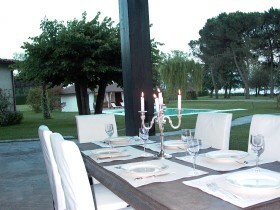 A welcome dinner is offered on the day of your arrival. A cook service is also available on request. The friendly owners live in a separate villa inside the property and are eager to offer you the finest services in order to reach your utmost wellbeing while granting your privacy without intruding. Italian, English, French and German are fluently spoken. > Bath & pool towels change on Wed. + Sat.